This project excavates and unveils an 1940’s era one-room guest house that had been weighed down and made cramped and dark by a series of ad hoc rooms attached throughout the decades. The circulation was through small doorways, the den had one small window, the bathroom had too many walls. The outside was either glaringly sun-baked (front drive) or too dark (porch). Replacing a collection of small doorways with a large opening in the wall, circulation and light as greatly improved. A new skylight brings light into the center of the house and activates the main circulation hallway. The bathroom was simplified, lightened, and tiled in white. 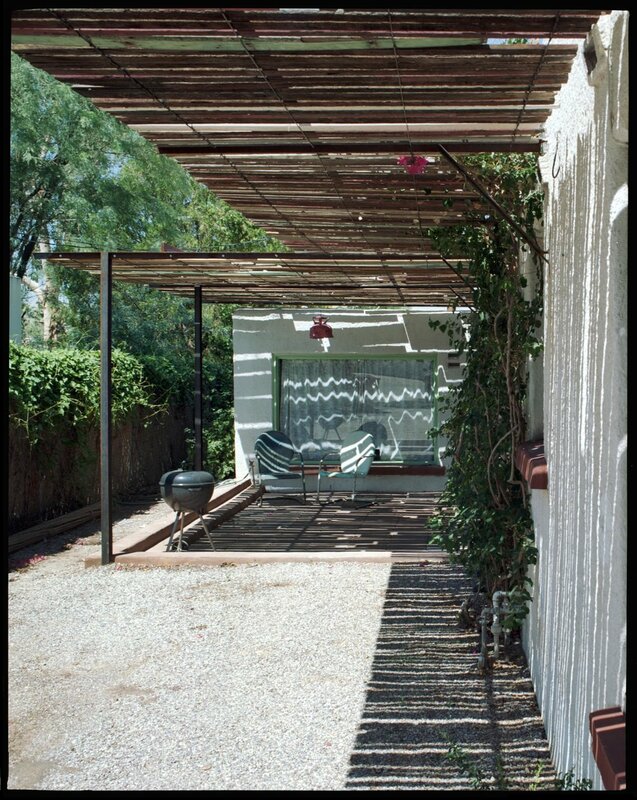 On the exterior, a new canopy, made from steel structure and reclaimed wood strips, provides dramatic, horizontal shade that moves across the yard and house over the course of the day.